I could not get the cap out of the mO, despite my rocking it back and forth. The idea of the magic Opener is that the cap stays gripped onto the opener to facilitate closing the bottle (while the cap is still there) once you are finished, so there is no need to hold or pull out the cap. My problem is once I am finished I cannot remove the cap to use it again on another bottle. The easiest solution to your problem would be to close it back slightly while the cap is still gripped, so that the cap stays onto the bottle, and then the opener can be removed easily. Another solution would be to close the other bottle directly from the opener with the cap still gripped onto it. Another easy option is that you can use the magic Opener to JUST break the seal off the cap, and remove the opener from the cap without unscrewing it completely. The cap should stay on the bottle, loose – and still easy for you to unscrew and open. How do I open soup or food cans with magic Opener? To open pull-tab food cans with mO you insert the opener all the way into the pull tab, rotate up about 45 degrees with the pull-tab still in place in the opener until breaking the can’s seal, then rotate it back again to the same position you started at (the opener is now horizontal to the can’s edge), but this time you will push it down 45 degrees slightly putting some pressure at the bottom of the opener, using the bottle opener as leverage. The can will open as you push down on it. This is very easy and hardly any effort is necessary. Before you open any cans, we recommend you to watch our video tutorial on YouTube where you can see how easily this is done: https://youtu.be/E3Ctua4DlQ4. Why do they say pain-free opening? Many people don’t have any problem opening beverages. Many others struggle with certain types of caps. Along with being so functional, magic Opener® easy bottle opener, is especially helpful for people suffering from joint and hand problems, such as arthritis, and those with limited hand strength. The comfortable, curved design and the extra leverage magic Opener® design produces makes it a very useful tool for those of us who need help — from smaller children to senior citizens. ANYONE will benefit from not fighting to twist off a bottle top or break a nail on a pull tab! magic Opener® easy bottle opener grabs and grips the cap. magic Opener® easy opener eliminates the pain and strain! What makes magicOpener ® DIFFERENT? magic Opener ® easy bottle openers combines the three most common types of beverage openers into one easy-to-use product. You can use it to open most plastic screw on bottle tops, aluminum pull tabs and metal bottle caps. The magnetic back permits you to place it on the refrigerator, or on any metal surface, making it handy to store and use. People are finding that the curved bottle design of magicOpener ® makes it easy to grip and use — virtually pain free opening with less effort on your part. Why would I want to purchase more that one magicOpener ® easy opener? How many places do you use or need some type of bottle opener? Other than at home, you might want to keep an extra magicOpener ® easy bottle openers in your car, at the office, for outdoor excursions (camping, boating, etc. ), in your purse — just about everywhere. By purchasing more the one at the same time, we are able to offer you a savings on multiple purchases and shipping. magicOpener ® easy openers makes a great (and thoughtful) gift! Why do you say magic Opener ® makes a great gift? You might not think of a bottle openers as a great gift — think again: For someone with hand/strength problems, it is most appreciated. For fishermen, hunters, boaters, outdoors men, etc., it is most useful. For soda and beer fans, it is most appropriate. For bottle and opener collectors, it is most ideal. For someone who has everything, it is most unique. For teachers or office colleagues, etc., it is most affordable. For neighbors and friends, it is most helpful.Can you think of anyone who would be very happy having an OPEN SESAME magic opener? Does magic Opener ® have any warranty? 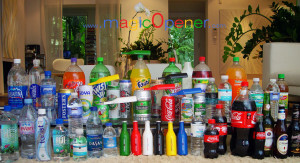 Will magicOpener® open 2-liter, 1-liter, and the 16.9 oz half-liter plastic bottles? To help you understand how it works I will start by saying that most soda companies have the same top size on their soda plastic bottles, it doesn’t matter if the bottle is the very small like the 12 FL OZ or like the medium 16.9 FL OZ or if it is the 2 or 3 liter bottle. Generally speaking the top is the same, it is called Standard size and it is mostly used in every country in the world. However when we talk about Water bottles that is really a different situation, water bottle companies change sizes like there is no tomorrow, some for a very small tops with the excuse that they are saving money in plastic and some others because they like to be different, no matter what the reason is, the truth is that water companies don’t care if a minimum part of the people suffer every time they want to open their bottles, they rather keep changing than keep it with the standard size so everyone can open it easily. For that, magic Opener has created patented interchangeable plates that can be selected for the specific one you need, they all work with the standard size of the soda bottles and have a second choice for the different variations of the water bottles. So no matter what plate you choose, it will open your small medium and 2 liter soda bottles as long as the big companies keep carrying it. Will magic Opener ® work on every water and soda plastic top? Most USA bottle manufacturers use a standard sized ridged plastic top. magicOpener ® easy bottle opener easily grips the ridged tops and holds securely while you twist. Through much testing, we can estimate that magic Opener ® will work on well over 80% of all USA bottle tops on the market — including the most popular sodas and waters (Coca Cola, Pepsi Cola, Canada Dry, Seagram’s, AQUAFINA, DASANI, FIJI, PERRIER Sparkling Water – etc.). Does the size of the plastic bottle matter? Most bottles use the same standard top. magic Opener ® easy bottle opener will work as well on the 8 OZ smaller water bottles as it does on the 2 or 3 liter size bottles. magic Opener has patented interchangeable plates that cover most of the regular smaller sizes ( XS – M – L ) including tops as big as the ones from Europe, like Evian water tops ( L ) very convenient for people who buy bottles with other size tops by boxes in Wal-Mart, Costco, Sam’s Club, BJ’s and similar. What doesn’t work with magic Opener? Sizes from Gatorade, Powerade, Vitamin Water and similar, doesn’t work with magic opener because the size of those tops are bigger than the magic Opener itself. The interchangeable plates doesn’t work with these big sizes neither. Although we are getting special opener for these size tops soon. Keep in touch and we will let you know once our patented new tool for bigger top sizes is ready for you to use. Does it work with all aluminum cans? Yes. You can use it with any soda or beer aluminum pop up tab. Normally, some European and South American cans are made of a softer metal than those from the USA or Canada. To assure the tab will open properly (especially with the softer aluminum), it’s always best to make sure the tab is completely inserted into the opener before lifting up. How does it work to open aluminum cans? EASY! You simply slid the aluminum tab securely into the slot at the top of your MAGIC OPENER easy bottle opener and lift it up. You don’t ever have to tug on the tab, or even touch it. MAGIC OPENER easy bottle opener does all the work. magic Opener ® opens metal caps, too? Yes it does. We incorporated the traditional metal cap opener into the design. It’s ideal for opening the metal caps on glass soda and beer bottles. Do you ship magicOpener internationally? Yes, we ship globally. We have satisfied customers from all parts of the world, including Canada, Australia, Japan, United Kingdom and over 50 other countries! Is the package shipped from the United States Postal Service? Yes, all International orders are treated as a Rush, shipped in a Priority service from the United States Postal Service office. Do you offer FREE Coupons in your website? How to Redeem your Coupon Just Log in to select the product(s) you want. Select Product Include a description of the products you’re ordering, include the coupon and your check (Deducting the Value of the Coupon) payable to Easy Opener Inc., and mail to: Easy Opener Inc MagicOpener.com Department 225 Malaga Ave. Coral Gables, Fl 33134 USA To see final price with tax if applicable you can follow the steps of you order until the final page shows. You’ll achieve the total price that way. (No need to finish the form, only until you see the total price before the personal information page shows. I have concerns about security- Is it safe to order online? Absolutely! We use the safest credit card processing system on the Internet, Managed one of the most reliable Internet merchant service in the market. All information about your order is encrypted, and cannot be viewed by anyone else. Ordering online using this state-of-the-art processing system is actually much safer than using your credit card in a restaurant, at a gas station or at the mall. What makes this bottle Opener different? 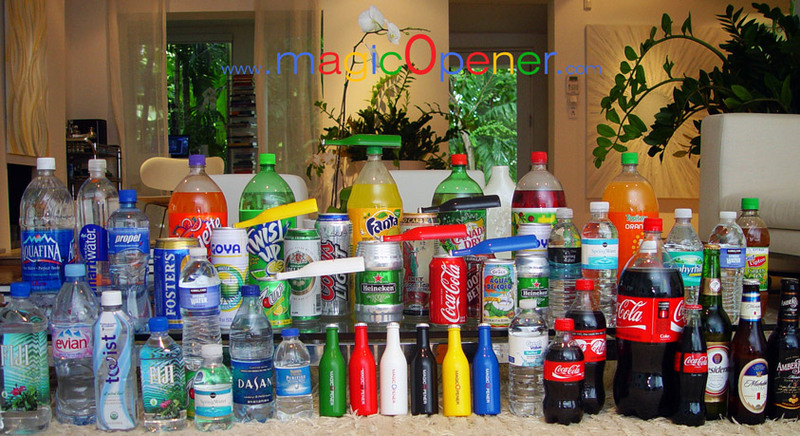 At the moment our patented and register magicOpener® is the only one in the market that really works with so many different sizes of plastic water bottle tops easy and fast. magicOpener the easy bottle openers combines the three most common types of beverage openers into one easy-to-use product. You can use it to open small – medium – standard and slightly bigger plastic screw on bottle tops , aluminum pull tabs and metal bottle caps. The magnetic back permits you to place it on the refrigerator, or on any metal surface, making it handy to store and use. What can I open with this bottle opener – magic Opener? All Coca Cola new twist-off caps, most water bottles from Costco, Sam’s, BJ’s, Wal-Mart, Walgreens, all different supermarkets, Drug Stores, Convenient Stores and Gas Stations. I found a site selling Openers for $5! Why should I pay more for yours? We would suggest you take a logical look at the site and the product. Remember you’ll get what you pay for, if what you are getting is cheap then a cheap product you will get, same as cars or anything else, you can buy a used car for under $100 but it probably won’t get to the next corner without braking on you. We have tested magic Opener® rigorously, we have gotten beautiful and encouraging letters from happy clients from all over the world, who knows they have the best opener there is, that; it will last them for a very long time without any worry because they know they have gotten the best with the best guaranty there is. How is magic Opener easy bottle opener made? We want magic Opener easy bottle opener, to be the Best and last bottle opener you’ll ever need! It’s made of high quality materials throughout: chrome-plated steel on the back and a durable plastic (strong plastic) front. The magnets will help you keep it handy and not worry about losing it. Can I choose any color I want for the magicOpener? We do have Yellow and Black in stock most of the time, of which you would be able to order by units. if you would like a different color it can be special order and minimum quantities are require. Different colors would be ordered mostly by promotional product orders or special orders over 2500 pieces per color. Can I buy the Easy Bottle Opener Open Sesame – magicOpener if I don’t have a credit card? Your Magic Opener comes with the most used twist-off caps size installed. However because water bottles has so many different twist-off cap sizes, if the one installed is not the right size of your favorite water bottle, then please select the most appropriate and just replace it so you’ll be able to use it all the time with your favorite brands. Once you get them, follow the instructions and you’ll be set in just a blink of an eye. Can I Return the Cans & Bottle Opener Open Sesame – magicOpener if I don’t like it?